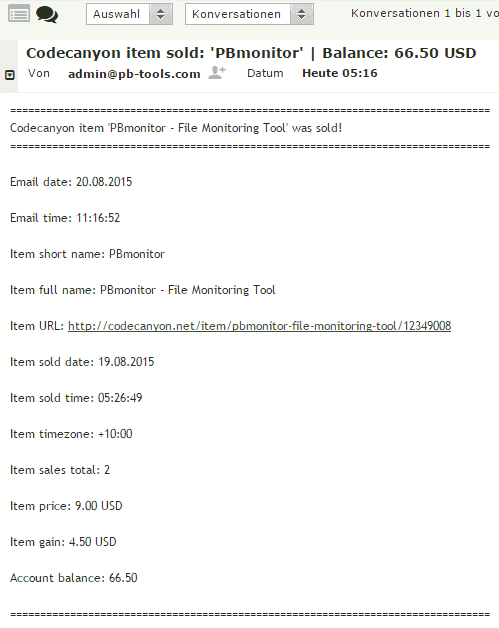 The PBsales tool can contact the Envato/Codecanyon API and check periodically (cronjob) if an item from your Codecanyon portfolio was sold and then sends you an e-mail with information about the transaction. Upload the PBsales tool directory (pbsales) to your webhost. Make sure that the script can write to his own directory. Edit the configuration file config/config.php and enter the API token and e-mail addresses etc. Add a cronjob which periodically runs the script pbsales.php. If you run the script in the webbrowser the parameter output=1 displays infos. If you run the script in the webbrowser the parameter email=1 sends a test e-mail. The PBsales tool is licensed under the MIT License (Expat) which is published on the official site of the Open Source Initiative.